READY TO INCREASE YOUR LEADS CONVERSION? How are Your Creative Stories Going To Look in the Future? We Want to Create Something That Does More Than Just 'Look Nice' on a Page. Everyone Can Create, but not Everyone is a Creator. What Makes the Difference is Having a Keen Eye for Detail and Beauty. Attracting Your Potential Buyers from Content Search and Turning Them into Your Customers. Start Seeing Your Site Traffic Grow After 4 to 6 Weeks of Content Strategies! We Deliver Best Practices in Social Media Marketing for Your Businesses Needs. Exclusive Content Creation Designed to Build an Emotional Connection With Your Audience. 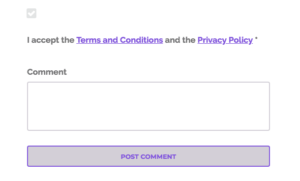 This post is about ‘The 3 Best WordPress Plugins for GDPR Compliancy’, and how to make your website as compliant as possible under the new EU GDPR Law. May 25th, 2018, General Data Protection Regulation (GDPR) Judgement Day! One month on from the 25th May 2018 GDPR deadline, I decided to write this article based on my recent research and practical action that I have taken so far whilst setting up GDPR for my own Digital Marketing Agency. I also looked at past clients websites and various other marketing companies to see how they had approached the GDPR. GDPR is here to stay and despite this government data shakeup, I am still amazed at the number of companies and business owners that have still not taken any action. It is estimated that around 12,000+ UK SME’s are still not compliant with GDPR. Although the governments have finally updated and enforced this Data Policy, there is no need to panic like a ‘headless chicken’ regarding your website and email sign up lists. Some simple steps can be taken to rectify this and will be discussed below. However, if you are a larger company that collects data on a large public basis, then you really do need to make sure everything is updated and fully compliant. Curry’s / PC World is now the first major company to be hit by a data breach 3 weeks after the new GDPR came in to force. This will be the first test of a large company and its Data Management Process management process will be deeply scrutinized and made an example of. How much the company will be fined (if anything) will be interesting to see. In this section, I am going to cover some of the GDPR Specific WordPress Plugins and resources that can help you make your WordPress website GDPR compliant. When I first started to set up plugins on my website for GDPR compliance, I found that I had to use a combination of 3 different plugins. 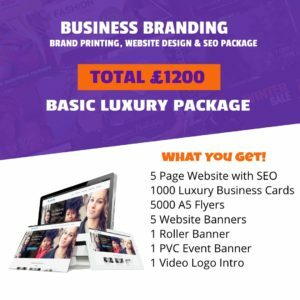 This was a headache at first until you got to grips with the way each one worked and added its own way of creating compliance for your website. Then, some of the third party plugins that are used for generating leads were not updated in time for GDPR, (mainly from companies in the USA). So trying to code these plugins with acceptance checkbox codes having to be inserted to each contact form made this a very laborious task indeed. Then came along ‘The GDPR Framework’ a group of European Lawyers that developed a GDPR plugin specific to setting up your site in one go. Almost! We’ll come to the almost later in this article. Using ‘The GDPR Framework’ does NOT guarantee compliance with GDPR. This plugin gives you general information and tools but is NOT meant to serve as complete compliance package. Compliance with GDPR is a risk-based ongoing process that involves your whole business. Codelight is not eligible for any claim or action based on any information or functionality provided by this plugin. For anyone using a WordPress website CMS, ‘The GDPR Framework’ plugin is the best thing since ‘Sliced Bread’. However, this plugin will only work if you have PHP Version: 5.6.33 or higher. There is a great plugin for this now since the update of WordPress Core 4.9.6. This plugin uses WordPress Core tools for GDPR Compliance. Since release 4.9.6, WordPress admin has some tools to handle Privacy User Requests. Administrators are able to create Data Request for every user in order to send or erase users data. This plugin allows website administrators to display Data Request Forms in front-end, for example in your Privacy Page. ePrivacy Law comes into place in 2019. Other plugin features include the possibility to code your contact forms by adding in acceptance checkboxes. It also creates the required privacy pages for you, if you don’t already have them! Then you can add these to your site and menus for total transparency. The plugin also comes with very detailed and well-documented tutorials that guide you along and help to make the necessary internal coding changes required to make your contact and blog forms compliant. To help you understand the power of this plugin, I have created a video walkthrough for you to follow. See for yourself why this is one of the best GDPR WordPress Plugins that will save you many headaches in the coming months. ‘The GDPR Framework’ plugin also creates Search Engine Optimised (SEO) friendly URL’s links for your privacy pages. Because, as we all know by now, you can’t just email anyone anymore. You have to wait for your website to be found and create content that your site visitors want and are willing to part with their personal data; in exchange for content upgrades, store discounts etc. Therefore, SEO will be one of the best and your No.1 arsenal in growing your emailing marketing lists. I find this plugin useful for clients websites that don’t have the supported PHP requirements that ‘The GDPR Framework’ requires. It is simple to use and allows you to make all of your contact and blog comments form GDPR compliant. However, it is a little buggy as all plugins will be at first, but they are improving fast. The plugin currently supports Contact Form 7 (>= 4.6), Gravity Forms (>= 1.9), WooCommerce (>= 2.5.0) and WordPress Comments, and they have additional plugin support scheduled in future updates. ACTIVATING THIS PLUGIN DOES NOT GUARANTEE YOU FULLY COMPLY WITH GDPR. PLEASE CONTACT A GDPR CONSULTANT OR LAW FIRM TO ASSESS NECESSARY MEASURES. So there we have it, that is my Top 3 WordPress Plugins for GDPR compliancy. 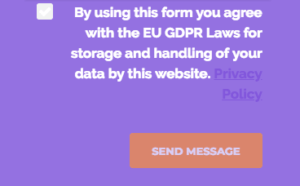 What actions did you take or not take towards GDPR? I would love to know how you coped with GDPR for your business. This post is about the 3 Best WordPress Plugins for GDPR and how to make your website as compliant as possible under the new EU GDPR Law.